The CRTPO adopted the 2018-2027 TIP, the 2040 MTP amendments, and an air quality conformity determination during the September 20, 2017 meeting. NCDOT maintains a “Live STIP” that is updated monthly based upon TIP amendments that are approved by the Board of Transportation. Click here to view NCDOT’s Live STIP. 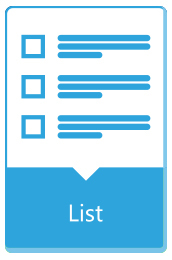 A list of Statewide program projects can be viewed here. The CRTPO held a public comment period on the 2018-2027 TIP, the 2040 MTP Amendments and an air quality conformity determination from July 9 until August 16, 2017. Public comment summaries and responses can be viewed by clicking here. The Clean Air Act requires the CRTPO to demonstrate that its Transportation Improvement Program (TIP) and Metropolitan Transportation Plan (MTP) conform to the Statewide Improvement Program (SIP). Transportation conformity is an important part of the CRTPO’s planning process. The Air Quality Conformity Determination Report can be viewed here and certifies that the projects proposed within the 2018-2027 TIP and 2040 MTP are within the prescribed limits for air quality within the Charlotte region. Federal regulations require Metropolitan Transportation Plans (MTPs), Transportation Improvement Programs (TIPs), and Statewide Transportation Improvement Programs (STIPs) to be “fiscally constrained.” The requirement for fiscal constraint is met through the preparation of financial plans, the requirements for which are contained in the joint FTA/FHWA regulations for Statewide and Metropolitan Transportation Planning (23 CFR 450). These regulations specify that the financial plan must be fiscally constrained for the first four program years of the TIP. The CRTPO’s Financial Plan for the 2018-2021 program years can be viewed here. 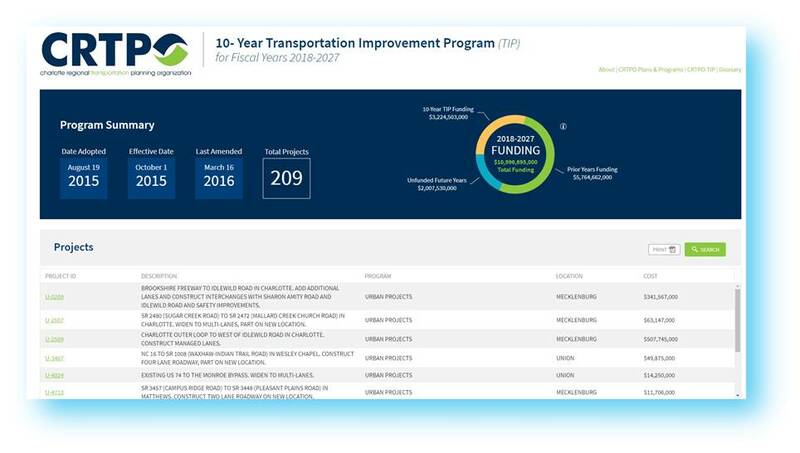 The CRTPO maintains an interactive, searchable TIP database as a resource to search for project information within the current 2018-2027 TIP. Federal regulations require Metropolitan Transportation Plans (MTPs), Transportation Improvement Programs (TIPs), and Statewide Transportation Improvement Programs (STIPs) to be “fiscally constrained.” The requirement for fiscal constraint is met through the preparation of financial plans, the requirements for which are contained in the joint FTA/FHWA regulations for Statewide and Metropolitan Transportation Planning (23 CFR 450). These regulations specify that the financial plan must be fiscally constrained for the first four program years of the TIP. The CRTPO’s Financial Plan for the 2018-2021 program years can be viewed here. NCDOT maintains a “Current STIP” that is updated monthly based upon TIP amendments that are approved by the Board of Transportation. Click here to view NCDOT’s Live STIP. 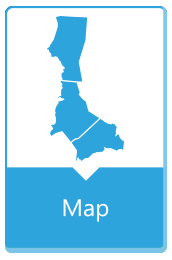 CRTPO TIP projects can be viewed in the maps and lists by county and mode below. The CRTPO is responsible for maintaining its current TIP by approving amendments and modifications to projects on a routine basis. These amendments and modifications must also be approved within NCDOT’s current STIP. The CRTPO Board approved a series of updates to its TIP Amendments and Modifications Guidelines during its meeting on October 17, 2018. The purpose of these amendments was to better align with the NCDOT’s STIP amendment guidelines. The CRTPO’s updated TIP amendment and modifications guidelines can be viewed here. Amendments to the Transportation Improvement Program must be approved by the CRTPO Board and must appear on the regular agenda as an action item. Two or more requests for amendments may be addressed by the MPO as a single agenda item. f. in design concept or scope significantly change the project termini or type, number of through lanes on a non-exempt project, or significantly alters the proposed transit coverage area. Amendments to the 2018-2027 TIP can be viewed here. f. changes in traditional funding sources occur. This includes a revenue-neutral exchange of two different traditional funding sources between two active projects. (e.g. the exchange of Bonus Allocation and STBG-DA funding for the purpose of allowing both projects to move forward).